Click here to book online or speak to our friendly receptionist to book by calling 0207 206 2681. Please read our privacy notice here before your visit. 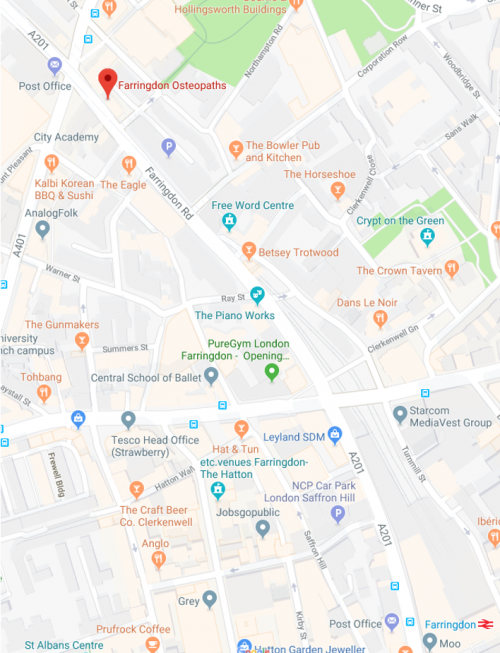 Farringdon Osteopaths is located at 96 Farringdon Road right next to Exmouth Market. We are in the blue estate agent’s building next to the chop house restaurant. The closest station is Farringdon which is a 7 minute walk from the clinic. Overland trains here serve South London areas such as Elephant and Castle, Loughborough Junction, Streatham, London Bridge, East Croydon, West Dulwich and Denmark Hill as well as North London areas such as St Pancras, St Albans and Luton. The underground is served by the Central, Metropolitan and Hammersmith and City lines. Bus number 63 stops just outside the clinic on Farringdon Road and the numbers 19 and 38 stop on Rosebery avenue right around the corner. To walk from Farringdon station: Exit the station onto Farringdon Road and take a right. Walk straight all the way along Farringdon road passing Tescos and a post office on the left, then continue straight through a junction with Pret a manger on the corner then past the Eagle pub and we are in the blue building on the right hand side next to the Chop House restaurant. Our clinic entrance has one flight of stairs downwards. Parking is in the huge NCP next door and there is limited street parking round the side of the clinic on Vineyard Walk too.